Boldly Blossom into your Bliss! Are you feeling called to make a difference in the world? To live your Bliss? Do you have a good job that pays well and even has decent benefits, but it really doesn’t fulfill you? Are your children grown, living on their own and you aren’t sure what’s next for you? Have you retired or are preparing to retire and wondering what to do with the rest of your life? What I've discovered through my own life experience and working with hundreds of clients is that you will change the world by first changing yourself from within. You won't change the world or anything else by changing things outside yourself. When you connect to your calling, when you connect deeply to your own soul and your unique brilliance you will experience your BLISS! Ahh...it feels so great! When life falls apart your callings are often accelerated. Are you listening to the calling coming from your soul? Do you know what you are being called to? Every flower blooms in its own season. ​Are you ready to blossom into your true beauty? My 3 JOYFUL SOUL SECRETS so you can live a BLISSFUL life you LOVE in tune with the calling of your Soul! SECRET # 1=BE YOUR VISION! Have a super clear direction-- a map of your ideal future. We'll write your vision statement that expresses your unique brilliance, your special gifts, who you were born to be! SECRET #2=CONNECT with your PASSIONS= Know what lights you up & sets your heart on fire! Don't waste your precious time and energy. Know the top 5 passions that you want to focus on now. SECRET # 3= LIVE YOUR LIFE PURPOSE–or what are you going to DO, contribute, or how will you express your special gifts with the world. Make a plan of ACTION! During this valuable session you'll discover what's stopping you from: living your bliss, listening to the calling of your soul, and feeling fulfilled by making your unique difference in the world. 2. Discover Your Inner Beauty Recorded Interview with Nina Price and myself. Learn 4 tangible ways to explore and discover your inner beauty that you can do right away. Nina Price is a licensed acupuncturist and midlife mentor, based in Palo Alto, CA. 3. Growing Your Heart's Desire 10 Worksheets Step 1 from my 7 Steps to Creating Your Heart's Desire Program. 4. 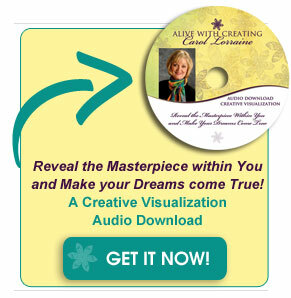 Creative Visualization Audio of Making Your Dreams Come True to use daily to support your soul blossoming. Start living your bliss!Stop waiting for it to happen—leaving it to chance, hoping it will happen--it won't! If you have no vision…you have NO DIRECTION, no map of your highest ideal future or who you are! If you take no action…you have NO RESULTS! If you have no passion….you have NO JOY or FULFILLMENT! If you have no vision, no action, and no passion…you are NOT LIVING your BLISS! You probably feel pretty dead inside! You need a VISION, a PURPOSE, and ACTIONS based on your PASSIONS to live life fully and feel ALIVE and in your BLISS! This way you define yourself first by knowing who you are, what energizes you and calls you forth based on what is important to you! Then I will email you to set up our appointments. “Before working with Carol I was confused, unsure, & wondering if I was in the right job... I am in action, speaking with confidence, trusting myself to make decisions in challenging situations, and staying true to myself! "Working with Carol I have unleashed myself and my creativity is flowing again! I am focused and tuned in to my artist self and enjoying my life so much more."